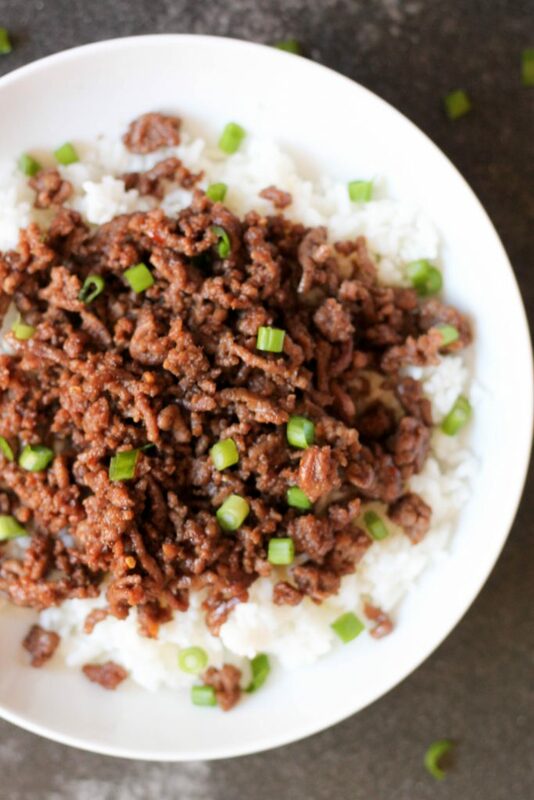 Our Korean Beef and Rice is the easiest meal you'll make ALL week. It's ready in less than 20 minutes, and it tastes just as good as takeout! 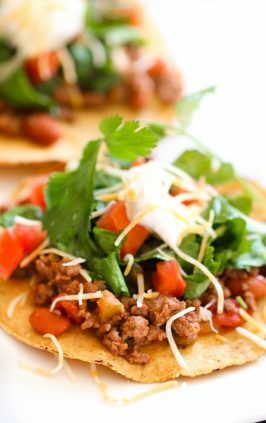 Using ground beef instead of sirloin slices, it's not only budget friendly, but KID friendly, too. I will be the first to admit that I am a lazy cook. I would much rather throw a couple of ingredients in my crock pot and let it do all the work than slave over my stove top at the end of the day to get dinner ready. When I wake up in the morning, I take a few minutes to put some stuff in the slow cooker and bam! Dinner is done! But what happens when you forget to throw those ingredients in the slow cooker?! And 5 pm rolls around and your kids are whining because they are hungry and you are tired after a long day . . . it’s like a mom’s worst nightmare!!!! Well, we had this exact situation at our house the other night . . . threw this recipe together. The ingredients were simple and I had all of them ready to go, so I decided to give it a whirl. I am SO happy to report that this recipe was a huge hit with the entire family and it will become a regular meal in our monthly rotation. We love that this recipe is only a few ingredients – and it’s ready in 20 minutes! Step 1: Heat a large skillet over medium heat and brown beef with garlic in the sesame oil. 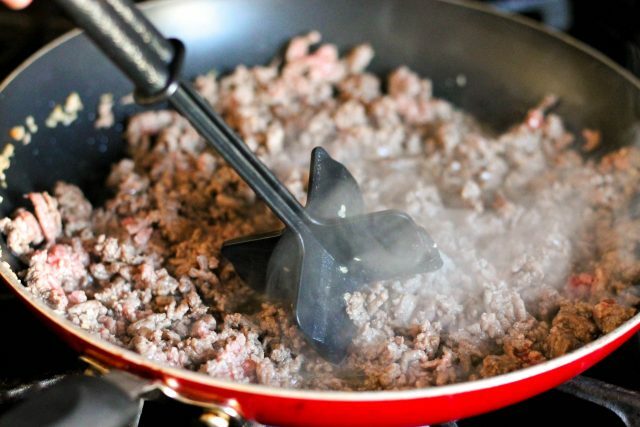 We love to brown ground beef using this tool. Step 2: Drain most of the fat (don’t skip this part!) and add brown sugar, soy sauce, ginger, salt and pepper and red peppers. Simmer for a few minutes to blend the flavors. 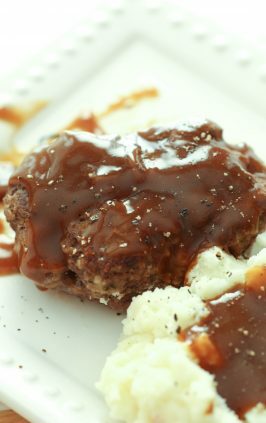 You can also use ground beef with a lower fat content, or use ground turkey to cut down on fat. Step 3: Serve over steamed rice and top with green onions. 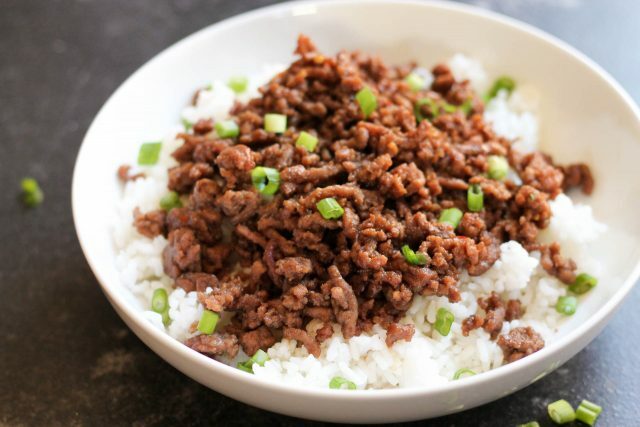 Watch how to make our Korean Beef below. Heat a large skillet over medium heat and brown beef with garlic in the sesame oil. Drain most of the fat and add brown sugar, soy sauce, ginger, salt and pepper and red peppers. Simmer for a few minutes to blend the flavors. Serve over steamed rice and top with green onions. I had this for the 1st time at my daughter''s and loved it. I halved the recipefor myself and will fix it again and again. Too funny. I made this for dinner last night before seeing your post. We really like this recipe. Super easy and cheap! OMG but I love simple and fast! I am making this tonight!! I'm just getting into Korean food (thanks to a friend). In fact, I just tried Kimchi for the first time this week. I can't wait to give this recipe a try. Anything with fresh ginger has to be great! trying it tonight! Made extra of the sauce and served with asian noodles, broccoli, and rice. Thanks for the idea - I searched for "ground beef". This sounds so interesting - I need to try it asap! Made this recipe last night and my husband LOVED it! I featured your recipe as my pin of the week on my blog as well. So happy that pinterest led to your blog. You ladies are awesome! I am always looking for an easy meal, I always forget to start my slow cooker! This looks sooo yummy! This sounds delicious (and I can't resist a quick dinner recipe). Going to have to put this on the menu for next week! I'm glad I found this recipe - I'm so tired of using ground beef for spaghetti sauce or chili. I'm not a fan of Hamburger Helper type dishes, so this recipe is a fresh new idea for me. This is really good. I will add a little onion while coking the hamburger. This has become a weekly lunch meal for us. Great for a busy day when lunch needs to be quick. My 13 year old made this for dinner and it was great. Only suggestion - stir fry some vegetables through it, they were a great addition. Made it with ground turkey. Delish! I never comment on blogs...but my boyfriend is about to purpose he loved this meal soooo much and it was SO easy & quick. Insanely good!!!!! .....and I used ground chkn, doubled the sauce and added broccoli. I'll probably be making this every week. Thank you for the awesome recipe!! This was absolutely fantastic! I used bison meat so I didn't even have to drain any fat. Less brown sugar worked well for our taste (probably 2/3 of what is called for). I served this on top of volcano rice, shredded red/green cabbage and cilantro for a huge 'salad'. Definitely a new favorite. My husband ate about 2/3lb of meat. Made this tonight for the family...was excellent - everyone loved it - even my sometimes picky eater that is 2! Will definitely make again! I've made this recipe many times, with the addition of raisins, and garnished with some shredded or shaved coconut. My family love it on a bed of basmati rice. I think that the mixture of ginger,soy sauce, garlic and brown sugar is basically the same as teriyaki sauce. Great recipe! It's super easy and delicious! Good -- quick and easy. Used ground turkey and added shredded carrots and zucchini and chopped water chestnuts. This is FANTASTIC. Served it over brown rice and added some onion and diced waterchestnuts to stretch it a bit and garnished with a big handful of green onions on each bowl. Served it with kimchee which really makes the dish sing. There is a highly acclaimed restaurant here in Minneapolis which serves a very similar dish in a bowl with a soft fried egg on top. 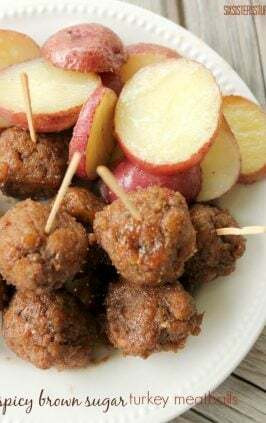 One of my husband's favorites and this recipe makes it easy to duplicate. He loves this with beer and I like KungFu Girl Riesling from Washington State. The World Street Kitchen Yum Yum Bowl?? I made this for the first time tonight and thought of that, too! I’m definitely adding kimchi next time! This was delish! Quick and wonderful and my husband ate the whole bowl! I just got my wisdom teeth pulled 5 days ago and wanted to eat something 'real', this was perfect! Not too hard to handle with a sore mouth but loaded with flavor. Thanks for the wonderful recipes! This is a great easy recipe. It is now in my rotation and my husband eats seconds. This recipe is amazing! 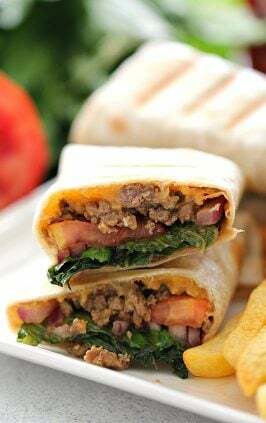 I work full time and am a single mother of 4 .I am always looking for quick meal ideas and not only is this quick but it is delicious!! ALL of my kids absolutely loved it!! From ages 18 to 7!! Amazing! Thanks for sharing, all of your recipes look great! So good! Ground turkey worked well for this, we are out of ground beef. Added onion during the browning...Also out of green onion! Will make again, for sure. This is so delicious! Big hit with the family. Next time I'd like to add veggies, which ones would you suggest to be added in here - just as filler. Thanks! I made this tonight and I could've doubled the recipe and not had leftovers it was that good! 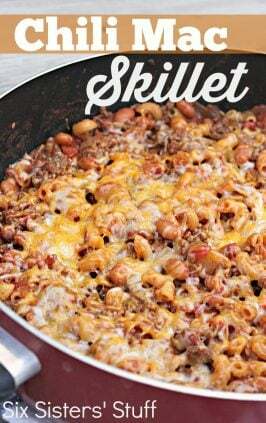 Made this last night for dinner and it was a big hit, even with the kids. 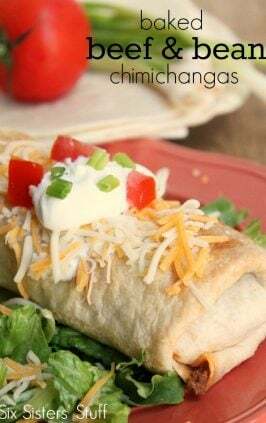 Very easy and very flavorful! Will definately be making again, maybe with 2lbs of meat in hopes for leftovers for lunch. Thanks for the recipe! I made this last night for dinner and my picky eater had 2nd's!! Fabulous!! Thank you so much for this great recipe. Hi. I would love to try this recipe, and I'm planning on making it this evening. However, it would be very helpful if your "print friendly" version could be condensed to one page with a photo. One does not need the story line leading up to the recipe, I just need the recipe. I think that if you are able to make your pdf's a bit cleaner and more concise you will attract more people. Just a tip, thanks for sharing your great recipes! I cut the sugar in half and my Korean husband loved it! We just made this as a plan B and are loving it. Thank you. Super easy to make and very tasty. Thank you for sharing the recipe. Yum!! So easy and great flavors. Didn't have sesame oil but put sesame seeds in it. Also used fresh ginger. I made this last night for my 2 sons & myself t hey're a bit picky but I must say this dish was a winner they even went back for seconds. So this dish is a winner in our home. The only difference I might do for me would be I would use low sodium soy sauce..but either way this dish was easy quick & delicious ..thank you for the recipe. Out of all the meals i make this is my husbands FAVORITE!!! My family loved this, but I will definitely cut the sugar in half next time. I added vermicelli rice noodles to it and we wrapped it up in lettuce leaves. So easy! This dish is great! I've made it twice so far and my family loves it! I have everything but sesame oil (I have seeds) will it make a big difference if I omit it? This is now a household favorite. We add shredded carrots to the beef and use honey or agave syrup instead of the brown sugar. This is really good! I forgot green onions, substituted brown sugar for plum sauce (no one needs that much sugar!) and added broccoli florets. Yum! Tried this tonight. My hubby loved it and so did my picky 16yo son! It is a definite keeper! Thank you!!! I made for my sons & mom & I & it was a winner..my sons ate every bit up the sweet with a hint of spicy from the chili peppers was perfect to the last drop. I made egg noodles for my 1 son for this dish & I used the brown sugar soy sauce & ginger just as measured in the meal & when noodles were cooked I heated up extra sauce & put cooked noodles in it & tossed..yummm! Yum. Eating this right now. Really tasty and so easy! I was skeptical of this... I'm half Korean and I grew up on this. :-) It exceeded my expectations! Will be making it again. I did make a couple tweeks. I added the green onions into the beef mixture at the end to cook it down a bit. I also made more than the recommended sauce mixture and added cornstarch to thicken it up a bit. Yummy- thank you! This doesn't take nearly as long as the original way. Made this last night and it was quick, easy and everyone ate it. I added the green onion to the mix at the end. Also added some peas and carrots to get the veggies in for the kids. Will def make again. the meat was done by the time the rice cooker went off. love this kind of quick weekday meal. This was SO delicious!! Thanks! I made this for dinner last night and it was really good. Today I ate the leftover beef on a flour tortilla with some sriracha sauce and it was amazing! My son is from Korea but only loves bulgogi and rice when we eat Korean food. When he smelled this cooking, he came into the kitchen and asked what it was. He wanted to eat it before it was even done! Thank you for this simple recipe that even my son likes. I make this for my family of 8 at least twice a month (I usually triple it, though). Tonight I used beef strips that were 50% off at the grocery store. It was DELICIOUS! Thanks for a great, easy, yummy dinner that my whole picky family enjoys! Using Ken's (Steak House dressing) Asian Sesame w/Ginger and Soy can supplement those ingredients in the recipe. I made this recipe last night. It was simple to make and tasted excellent! Thanks!! I made this last night for my daughter and I, using veggie crumbles instead of meat, and it came out amazing. I left out the red pepper, because all I had for sesame oil was the hot kind, and it had a lot of heat! I also used fresh ginger, and coconut palm sugar instead of brown sugar. Served it with jasmine rice and kimchi. Loved it, and will definitely make again. This is really good. I didn't have any soy sauce so I got a recipe for it from allrecipes, took it down to 1/4 cup recipe and made it right in the pan with the burger adding the other ingredients also. I also added frozen peas to my husbands and frozen chopped broccoli to mine. It was very delicious and so quick and easy. I posted it on my 2nd fb page Good Eatin (look it up and "like" the page for more recipes). This is a must try! I just made this for the first time and it is AMAZING! I used honey in place of the brown sugar and gobbled all of it up. Thanks for the great recipe! Easy to make and so delicious! Love sesame oil and Asian dishes. Would be amazing in a wrap! 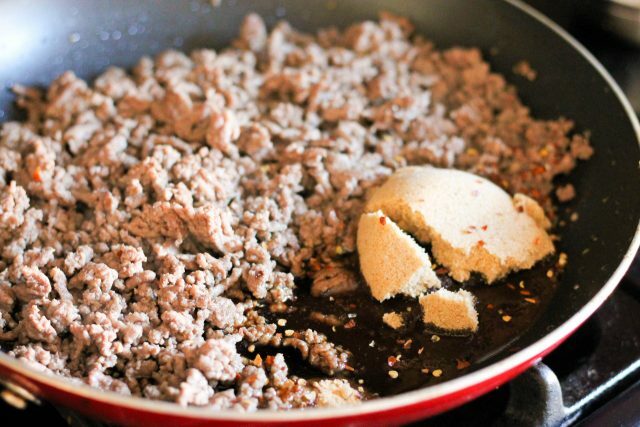 I love that this can be made with ground beef! This came recommended to me by a friend. I'm going to try it tomorrow night and pin to my Dinner Recipes board. Thanks so much! We tried this tonight this is an awesome recipe. Thank you we all loved it. Yum! Was in a dinner bind and searched ground beef... threw in some broccoli for good measure! Will be adding this to the mix for sure, thanks for posting! Easy and tasty. This recipe will make it into our regular rotation. Even making it the first time, it took me less than half an hour and dinner was earlier than planned! We ate it over rice and with steamed broccoli. How many servings is this? Is there anyway you can add servings to your recipes. I have 3 very BIG boys who eat a lot. I always have to double my recipe. This recipe serves 6. We changed our website about 4 months ago and our newer recipes have the servings on it. With our older recipes just click on the MAGIC button under the picture and it will give you the servings and all of the nutritional information on that recipe. I love the magic button - so helpful. For this recipe, is the nutrition information for the beef AND rice? Or should a serving of rice be calculated separately? I looked into this recipe further and the nutrition information is for the meat only. You will need to calculate a serving of rice. Thanks so much for stopping by our blog! This dish was a hit with the family, Thank U! My husband is going to make burgers next time with the recipe (fingers crossed). I made this last night and it was delicious! My whole family loved it. We added chili paste to ours because we love spice :) Thanks for sharing. I make this pretty often and was always trying to figure out what to serve with it. I've done broccoli and that is delicious, but last time I added frozen green beans and let them cook in with it and it was a huge hit with my boyfriend. This time I added green beans and a fresh red pepper. I can't imagine it being bad! Thank you so much for this quick and delicious week night meal! I really didn't think this dish would be that great considering how simple it was, but it was the only recipe I could make without having to go the the grocery store for more ingredients. WOW! It was great, I threw in 1 cup of frozen kale while it cooked. My husband gobbled it up and said I should make it again soon. He recommended topping it with a fried egg, so we might try that next time. He also covered his with sriracha. So glad I gave this a shot! My family loves this recipe. I make it regularly and it quickly disappears! We sprinkle on some toasted sesame seeds with the green onions, yum! i just made this for dinner and it FAR exceeded my expectations! I want to try this sauce on other kinds of meat it's so good!!! Loved this receipe. I added onions and mushrooms to meat and served it on lettuce leaves, for lettuce wraps, yum! This was amazing! My husband is a major nit-picker when it comes to food, and had nothing negative to say about it - he really liked it too. It makes great leftovers too - we ate it for a few days! I'll definitely be sticking this in the cookbook to put on dinner rotation! Thanks for the great recipe. I know there will be clean plates when I serve this! Thanks so much! Is one of those quick meals that is a go to on those nights when Im in a crunch. I was scrolling through pinterest for a ground beef recipe that was fast and easy. I was excited to find out I already had all of the ingredients! I made it before I went to work for my family to eat for dinner. I doubled the recipe, but after tasting it, I really should have tripled it! So yummy!! Great recipe, thank you!! Great recipe, added a bit too much fresh ginger and I did not have red pepper flakes so I had chili garlic sauce on hand and added that. I loved it, hubby found it too warm. Delish!!! Will make again for sure, just will add less ginger and chili garlic sauce. I made this for dinner tonight with fresh ground venison, and a side of sauteed broccoli, snap peas, red peppers and onion.. It is divine.. I will make it often, my 3 girls and hubby love it!!!! I have made this before but this time I layered some cole slaw mix (shredded cabbage and carrots) over the rice and under the beef. Added a nice crunch! Also, using the full 1 tsp of red pepper flakes adds just the right amount of spice. This is one of our favorite, regular meals now! We kick it up with chopped and sauteed mushrooms, red bell pepper and a carrot! It is deeelicous and thanks!! My family loves this one! I add sesame seeds to the top with the green onions. It's a little more "authentic". So yummy! We actually had it last week! I make this all the time - even my youngest son eats it. Great recipe! I just made this tonight and it came out great!! 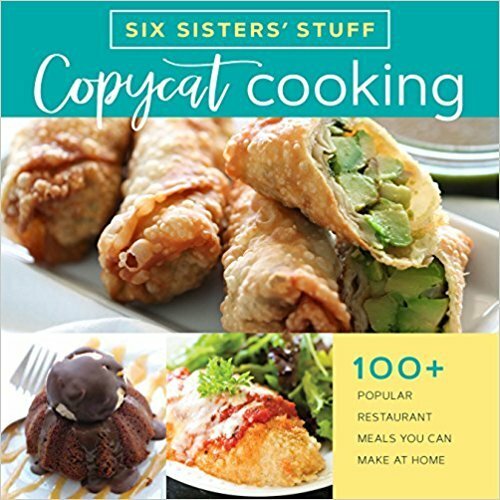 Thanks for a terrific recipe ??? I love this recipe! And I love y'alls blog! But I hate that you have added so many ads that your site freezes and loads SO SLOW now! Makes it tough to want to use it! It took me 6 tries on different computers and web browsers to even be able to write this comment! PLEASE GET RID OF SOME OF YOUR ADS TO KEEP YOUR LOYAL FANS! Made today! We LOVE it! Thanks! So, so good!! 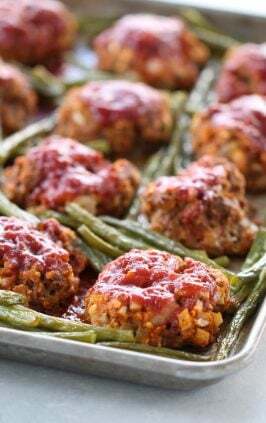 It's great with green beans, who needs takeout with this yummy & quick dinner, right? ? I have made this recipe so many times! :) I may have even commented already, I can't remember. Tonight I pulled the recipe up to use with some shredded chicken I had in the freezer. Added broccoli and carrots and another 1/4 cup of soy sauce and served it over brown rice. Perfect! Thanks again. Thanks Shawna!! You are so sweet! This is a family favorite for us too! Have a great week! It was very delish!!!! My husband loved it. Thanks for sharing ? Thanks you very much for this delicious and healthy food.I have review these days restaurants are adding digital menu for customer ordering. I have try nice one menu system with menu pads in my restaurant through they have great ideas for future restaurants. Look so nice. I will try to cook it. I make this all the time, it's a family favorite! I've started making it with half the sugar and usually replace it with honey. Thank you for the recipe! I made this last night and it was a huge hit with my family. Thank you so much. We're definitely making this a weekly dinner! I found this recipe by searching "ground beef recipes" on pinterest 5 days ago...and since then I've made it 3 out of the 5 days! Just love it! Any ideas on how to cut down the sugar? Thanks for sharing! We LOVE this recipe!!! I did make a change though. I used either frozen shaven steak (Walmart brand is called Philly steaks, I think) or if I can pick up a steak cheap I will cut it very thin and use that. It is sooooo good!!! Fabulous, quick and easy! Picky kids loved it too. This is one of my boyfriend's favorite meals! I add a mushroom blend and baby bok choy to it and sprinkle sesame seeds on top with green onion. Always a satisfying and easy dinner !! ? This recipe is so good!! My family likes onions, so I brown the meat and after it browns a little I add some sliced onions and let them cook until they soften. I always have to double the recipe because they like it so much! Thanks for the recipe! Oh my yum!!! Super easy and delicious. I added carrot straws and snap peas just until crisp tender. Thanks for the recipe! I love this! I make up the sauce recipe (doubled) for use on other dishes, like Broccoli and Shrimp. I also add Cornstarch to thicken it a bit.